No project is too big, too small or too complex for Sockeye to take on. Regardless of the scope, Sockeye works to meet the needs of our clients in the timeliest and most cost-efficient way and always with an eye to quality and safety. We have worked with various companies to create some amazing camps and projects. Western Canada’s first five story wood framed modular project, Sockeye proudly teamed up with Metric Modular to install 90 units. Project was completed on time allowing students to move in for the start of the school year. 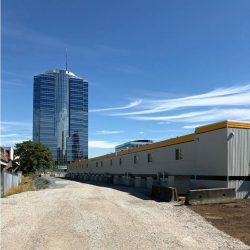 Our construction crews set and connected the modular units and our mechanical team provided all the hook up services. 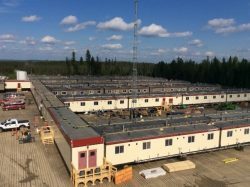 Sockeye constructional and mechanical teams successfully installed 608 beds and a 35-unit kitchen/diner/recreation complex on the mine site in northern Ontario. Successful installation to set up 100 plus beds on two locations in the lower mainland as part of the BC Governments initiative to combat the housing crisis. A turnkey installation of 246 beds, all dorms, kitchen and recs connected by arctic corridor. Install completed summer of 2018. 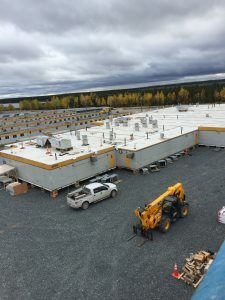 362 beds in an open lodge southeast of Grande Prairie, opened in the fall of 2018. 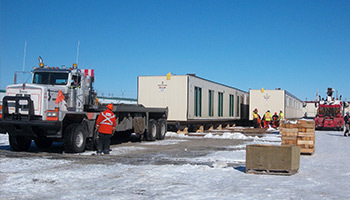 After meeting one of the field managers from Greensmart at a Modular Building Institute workshop, Sockeye was contracted to help with the install of an office expansion for MEG Energy just outside of Conklin, AB. A crew of 8 were sent up to help with crane setting 6 units on steel piles and I beams. There were 2 locker rooms at 18’×50’ and 4 control room units measuring 24’x50’. Greensmart manufactures all their units using SIP technology. All cladding, trim, skirting, and downspout work was done on site. We also took care of marmoleum flooring joints and tiles, grouting all tile work in the locker rooms, installing all windows and all the other finishes. This was a big job, with the crew going the full 24 days on site. We constructed the relief camps for the each of the bands of the Stoney Nation: Bearspaw, Chiniki, and Wesley in the aftermath of the floods caused by the heavy rainfall around Calgary in June of 2013. These camps are going in for a long duration while the bands rebuild the residences that were lost. That meant tinned utilidors, broad walkways, stairs with covered landings, loading docks, large decks, and skirting. Our carpenters customized many of the recs and offices by installing and finishing new walls. Our new mechanical team took care of part of the plumbing. After the disastrous rainy season in June 2013, Sockeye was one of the first contractors on the scene at High River, prefabricating structures and racking units in anticipation of ground being broken for the relief camp.Lodgings were set down and activated fast as the excavation crews could release the pads. We managed all aspects of the project construction, aside from the earthworks. Saddlebrook was the first camp in the aftermath of the floods to open its doors to residents, and our crews continued to work ceaselessly until the camp was completed. We are proud to have helped create a safe, comfortable place for flood victims to stay until their homes were repairedor other accommodation was secured. This was the first camp ATCO has ever had a subcontractor install for them. It was a 330-person VIP camp consisting of eleven dorms, a kitchen, and a rec, with an arctic corridor tying everything together. Our crews set the units, installed and sealed the roof, installed carpeting and lino, finished the drywall and batons, installed utilidors, and built all the parking rails, stairs, landings, and loading docks. The Mt. Milligan project is a construction camp for a copper-gold mine in North Central BC. 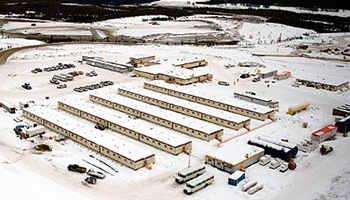 Black Diamond Camps was contracted to provide upscale work force housing for a Canadian mineral development and exploration company. The camp grew to an eventual 1000 beds and a 30 unit kitchen/diner/recreation/office complex over 7 phases. Sockeye provided crews for all phases of construction. We had crews doing everything from setting dorms to finishing the interior of the dining rooms and rec room. Mt. Milligan has been our longest running project with over 6000 man hours. It is a beautiful setting and a well appointed camp. 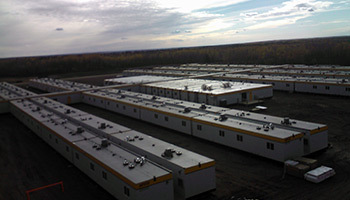 In the Spring of 2012, Redrock Camps was awarded a 360 bed expansion of an existing camp at a large SAGD facility in the Cold Lake area of Alberta. Our crews had been in there in December 0f 2011 to set 4 dorms on the site (originally used an overflow for an existing camp nearby), so we were asked to come in and complete the camp. The construction schedule was very tight, and with the help of some excellent utilities contractors we completed all work on time. This was one of the bigger jobs we’ve undertaken in such a short period of time, Sockeye had a crew of 22 guys at one point working on site. 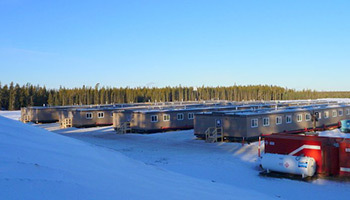 This is an annual winter oil sands exploration camp project. Our client Redrock Camps is contracted to provide accommodation and catering for 3 separate camps in one area. 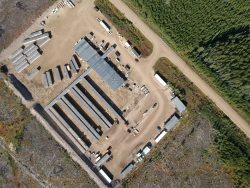 Sockeye’s scope is to provide install services for what they called an advance camp and 2 main camps, and also to take care of installing what they call Tin Towns (consultant/engineer/management single units in a separate area on their own services). Advance camp is an 8 unit drill camp which we install late November as near as possible to the beginning of the Steepbank ice road. This camp provides the road and lease building crews as well as the safety personnel with a base camp from which to operate for a couple of weeks. Once the ice road is passable to km 29, we move Advance camp to that spot and the road crew keeps working. Once they reach km 47, we return to build North Camp, a 176 bed camp which allows some of the drilling and seismic crews to start their program. Once North camp is up and running we move onto building Main Camp at km 67 across the Steepbank River (another 176 beds). Weather permitting, we complete all construction by early January. In mid-March we return to dismantle everything in the reverse order, racing against Spring break-up and slushy roads. The equipment is racked and stored on their respective sites for the summer. The last thing we do is tear out the Advance camp which is by then being used for the road de-activation crews. 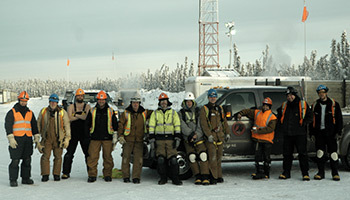 Sockeye scored amongst the highest in safety audit results throughout the install and dismantle for the last 2 seasons. We enjoy working with Cenovus and Redrock and are able to expand on our own safety program and installation skills every year. The “Lodge” as we affectionately call it was a brand new Britco manufactured 8 unit drill camp. Redrock worked with Britco’s designers to come up with a slightly different design for one for their long term clients. The dining room and rec we’re opened up into one big room and they decided to make use of pocket doors to make traffic flow more easily. 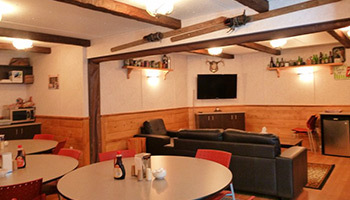 This camp has a total of 35 single rooms, which is becoming the norm even on drill camps. Redrock had the innovative idea to make the finishes warmer and to “lodge” up the hallways and the public areas. Upon receiving the units, we complexed and heated them up in Edmonton. We then installed and stained bead board wainscoting and pine chair rail/baseboard throughout the complex. The rec/dining was treated with stained horizontal pine board as a wainscot with a nice fir chair rail. We finished off the look with heavy Douglas Fir shelves and fir block end tables. We filled the shelves and walls with antique curios, old signs and poster/billboards on the walls and even a couple of pairs of antique wooden skis. This customization of a smaller camp is quite unique and has generated interest from other Redrock clients. We have already started planning for different themes for future projects of this sort. This project was a partnership between Redrock Camps, Parks Canada and the Labrador Inuit Development Corporation. 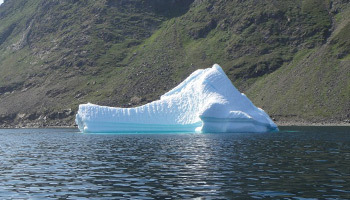 The project requirements consisted of a 3 season research facility to be installed on Inuit land on the very edge of Torngat National Park in Northern Labrador. It was designed to utilize non-conventional energy sources for heat and power and the whole structure had to be polar bear proofed for the winter. 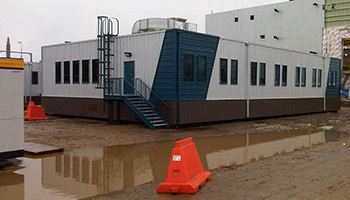 The complex is a 7 unit self-contained drill camp type facility manufactured in Fredricton, NB, trucked to Goose Bay, NL and barged to the site in 3 loads. This camp was Redrock’s first ever solar powered installation. Sockeye was contracted to provide on site supervision and training for local labour for the installation and finishing. The construction window that far North is essentially July and August (with the occasional cold spell in there as well) so we had to get the equipment in and closed up. The extreme isolation challenged our resourcefulness and ingenuity but regular boat, helicopter and plane charters provided us with a supply chain of sorts, with the occasional weather delay due to extreme winds or dense fog. The beautiful setting and excellent people we met and worked with on this project made it all come together successfully. We hope to have the chance to work on more projects of this distinctive nature. Clowhom was our first coastal barge access project. It was for a run-of-the-river power construction project on the Sunshine Coast of BC. 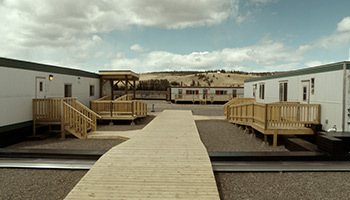 The majority of the units for this 100 man camp were new Britco built dorms and wet sleepers with a rental kitchen. 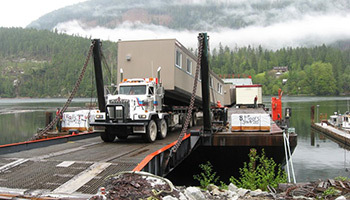 The units, materials and equipment we staged in Vancouver, and barged to up the coast to the end of Salmon Inlet. Everything was then transferred onto the landing and hauled 25 km up the logging road to the camp site. The site, located along the forestry road, was challenging in itself. We had to get creative to fit everything within the cleared area. Clowhom was by far the most scenic site we’ve gone to for an install in Western Canada. Water taxis, driving logging roads and just being up a coastal valley brought us back to our forestry roots.